Joey regularly posts photographs with short stories on his Instagram account, follow him on Instagram to read the stories as they are posted. Lighting in West Hamilton, surrounding the McMaster University campus, not one of the issues that I’ve ever really thought about. Last January, when current MSU President Ikram Farah was running for McMaster Students Union President, one of her platform planks was installing of LED lighting in the neighbourhoods surrounding Mac. This caught the attention of those of us who hang out at City Hall. I recall my first conversation with then Ward 1 Councillor Aidan Johnson, both of us were unsure when LED lighting would occur in Ward 1. Turns out it was already scheduled for the summer. City Hall started installing LED street lighting in 2016 with Ward 2, then went east before looping around the wards, with Ward 1 last. From this, many at City Hall took away that in the future, Ward 1 needs to be thought of with the same pedestrian focus as Downtown is. Aidan Johnson told me he planned to have the street lighting audited after LED installation. In December, I walked around Westdale to enjoy the Advent windows. As I was walking I took notice of where lighting was poor; trying to determine for myself the extent of this issue the MSU was lobbying City Hall to address. With so many beautiful mature trees in Westdale, there are many spots where street lighting is blocked. In particular, Bond Street just south of Marion was a spot which was noticeably dark to me. In many communities which have installed LED lighting, it has been necessary to add separate street lights for sidewalks. LED lighting is much focused, whereas older lights were not, and those old lights “bleed” more onto sidewalks. Downtown Hamilton already has pedestrian sidewalk lighting in locations, such as in front of City Hall. 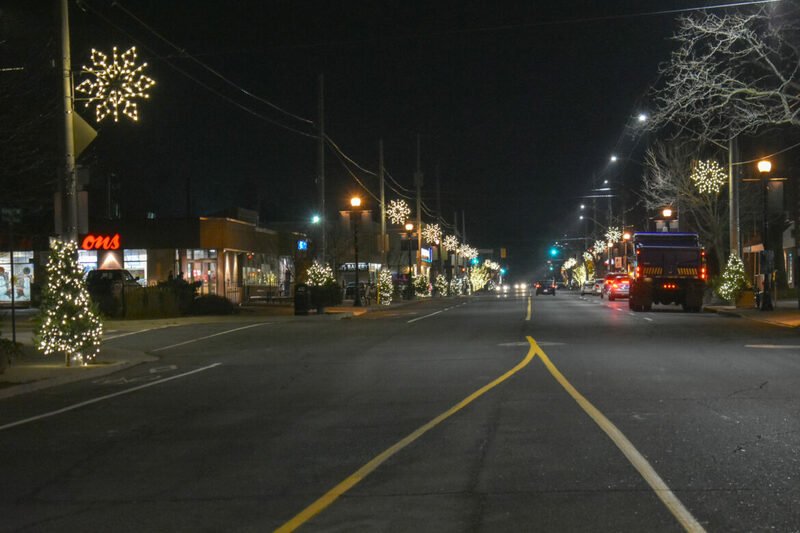 It will be interesting to see how lighting is improved in Westdale in the coming years. Now, some of you may be wondering why I’ve devoted a note to this topic? I used to cover post-secondary education, and oft-criticized student politics for not focused on issues they could effect change, and not focusing on local details. It’s been great to watch how engaged Mac students have become in recent years. Plus, I had this great photo of Westdale Village in December I wanted to post.